Play games with your toddler to help them learn. 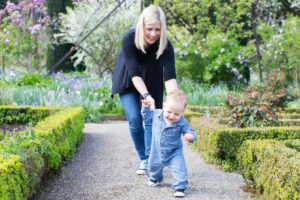 Playing with your baby can help them reach major milestones. Here is a list of fun games to help your baby practice communication, sensory, and motor skills. Encourage baby to kick a ball on the ground. 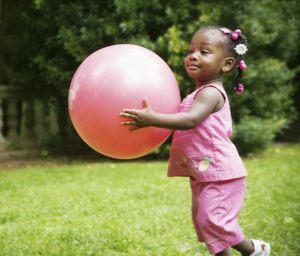 Gradually build up to rolling ball so baby can kick it while in motion. Put on some silly songs with lyrics that give listeners instructions like “The Hokey Pokey”. Dance with baby while following song directions. Let baby play with a musical instrument if you have access to one. For a drum, baby can use wooden spoon & cardboard box. Babies love hearing sounds they make by beating a drum or playing notes on a piano. Blow bubbles for baby. Let baby touch them, watch them soar through sky and pop when they land. Wrap a table in plastic and spray shaving cream. Encourage baby to explore the shaving cream with hands, brushes, spatulas or plastic spoons. Fill up a bucket with blocks of different sizes, textures and colors. Ensure that none are small enough to be swallowed if baby decides to explore them with their mouth. Allow baby to explore the blocks with all of their senses. Go through family photos with baby and encourage them to point out familiar family members. Sing nursery rhymes with actions like “Itsy-Bitsy-Spider” and “Patty Cake”. Use a play telephone to practice different ways to say hello or goodbye, such as bye, bye-bye, goodbye, etc. 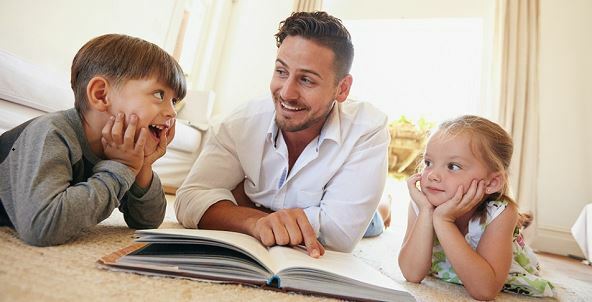 As you read to your toddler, encourage them to point out familiar objects in the illustrations. Go on a nature walk in a park or even in your backyard and point out all of the animals and interesting plants you see. This is a great age for encouraging baby to practice the meanings of “in” and “out”. Ask baby to put their toys in a bucket and take them out again. Blow bubbles to fall down in front of child while standing. 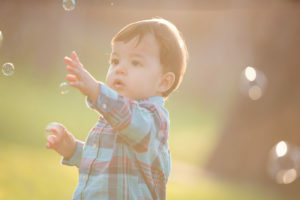 Encourage him to pop bubbles by clapping between hands or by poking with his finger. Grab a toy that your toddler can sit on top of as you bring her around your house or on the sidewalk. Your toddler has to stay on by holding a handle and using her legs. You can set up a mini obstacle course in your living room. Make pillow stacks to crawl over or lay a blanket over a table to make you toddler crawl under it. Give your toddler their own drawer or box of “treasures.” These can be new toys from the dollar section or objects he would find interesting. Let them look through it and whatever they pull out you can use to play with. Create a new living space underneath a dining room table. Add in some pillows and his favorite toys to make it like their own house. Chase your toddler around the room saying “I’m going to get you!” Let the anticipation of catching her build until you eventually catch them. Set up empty water bottles to make bowling pins. Show your toddler how to roll the ball to knock down the pins. Balloons are fun when they’re inflated and decorate a room, but they’re even more fun when you let them fly around the room. Instead of tying the end of the balloon, let it go and see it whoosh around the room. Let your toddler get it and bring it back. Tape some contact paper (sticky side out) to your wall or window. Give your toddler a few different objects like cotton balls that she can use to throw or place onto the contact paper and watch it stick. Make a little slit in a box to make it your toddler’s personal mailbox. Then put in junk mail that you get and let him tear it open. Get a small water bottle and fill it with different objects. Let your toddler shake it around and discover glitter, pebbles and other objects as she turns it in her hand. Make sure the bottle is securely sealed and filled with age appropriate items. Create a ramp. Let your toddler roll different objects down it to learn about how gravity works. Get some brightly colored objects, like bouncy balls, and place them around the living room. Then let your toddler walk around and try to find them. Don’t make them too hard to find though. Your toddler can count them out as she finds them too. Get outside and put different sized balls on the ground. Set down a hula hoop and have your toddler gather the balls and put them inside the hoop. Play chef and use measuring cups for your toddler to fill with cheerios. Then let him serve you the cheerios as a snack. He won’t understand the different measurements yet but scooping and dumping will be fun for him. Find a large cardboard box that baby can play in. Place baby in the box and pretend she is in a race car. Make engine noises and pretend to turn the “steering wheel.” The more noises you make and actions you do the better. Play with your toddler by naming different body parts and pointing to them. Let him identify which body part is which. You can name the body part first and have your toddler point to it or you can point to a body part and have him name it. Either way, he is learning while having fun. Have a dance party with your toddler. Put on some upbeat music and dance with him around the house or outside. Bring new life to stories by making sound effects. Someone’s stamping their feet in the story? Pound your feet on the floor. A wolf is howling? Give it your best howl.